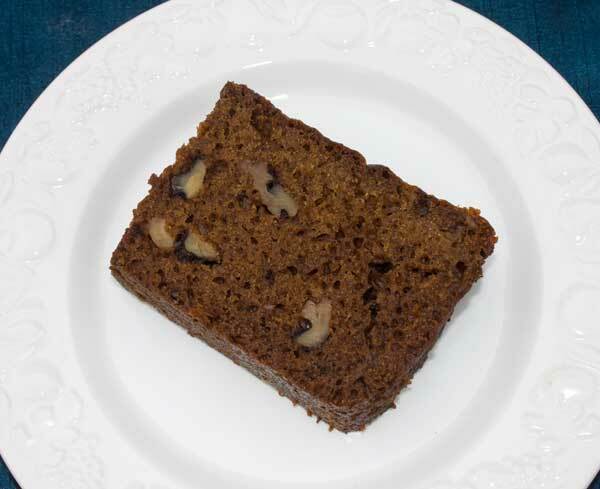 Just when you think you’ve tried every banana bread recipe in the book, along comes this one from The Fairmont Hotel. Carolyn from Canada has been making it for years, and wanted to share it because it’s a little bit different. What’s unique about this Low Temperature Banana Bread is that it’s baked at a very low temperature for 2 1/2 hours. It also calls for more baking soda than other recipes (a lot more) and instead of adding the flour alternately with the milk, you add the flour alternately with the eggs. So what happens when you bake at a low temperature, use a lot of baking soda and add very little air to the batter? You get a really dense, sturdy, but moist banana bread that slices neatly and is great toasted. Another interesting change that occurs is the color. The bread appears to have cocoa powder or brown sugar in it, but the brown color is most likely due to the reaction of the baking soda. Thanks to Carolyn for sharing this recipe. If you try it, make sure to really grease and flour the pan. Update: I still make this recipe often. The first version calls for a huge amount of baking soda and the bread comes out a deep brown color. Some people perceive the baking soda flavor as lemon, while others just like the long finish. Honestly, I’m not even sure the amount of baking soda listed on the original recipe is correct, so sometimes I make it with much less. With less baking soda, the bread is less crusty and not as brown. 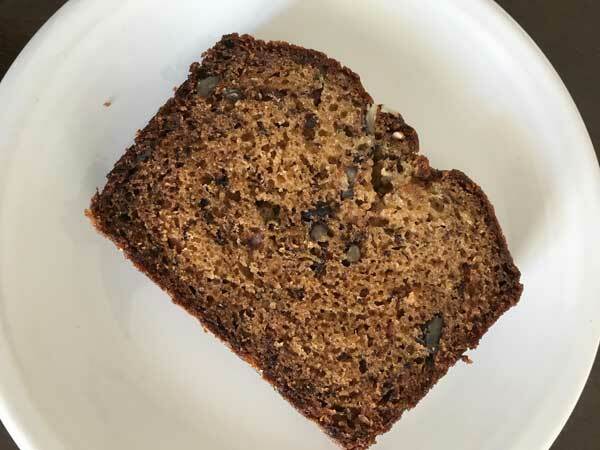 Low Temperature Banana Bread is based on a banana bread from The Fairmont Hotel. I've always baked this at 275, but I recently tested it at 300 and it still browns and tastes just as good. Preheat oven to 275 degrees F. Grease a 9x5 inch loaf pan, line with parchment paper and grease the parchment. Dust with flour. This is important, because the loaf is rather sticky! In a blender, puree the bananas, sugar and baking soda. Empty banana mixture into a mixing bowl. Mix in the eggs and the flour alternately, stirring until well blended. Mix in the oil, buttermilk and salt, beating with a spoon until blended and smooth. Add the vanilla (if using) and the nuts. Pour batter into prepared loaf pan and bake for 2.5 hours (though check for doneness at 2). Let cool completely, then carefully remove from the pan. If baking at 300, check at 1 .5 hours. Internal temperature of banana bread should be around 205 so if you are not sure you can stick a probe in it to test. The amount of baking soda seems like a lot, but it's what the recipe calls for and it's probably what creates the dark brown color. Update: I've reduced the baking soda to 2 teaspoons and the bread still gets pretty brown. Make sure to really grease and flour the pan well, as this bread is sticky! I used foil and nonstick spray, and still had some stickiness. Hello Roberta! I’m glad you tried the (similar) recipe and are happy with the results. To keep the bread fresh, I recommend freezing it. It should taste as good as fresh if you wrap it tightly, freeze it and thaw before serving. Thanks for reminding me about this recipe because I have a bunch of bananas that need to be used. 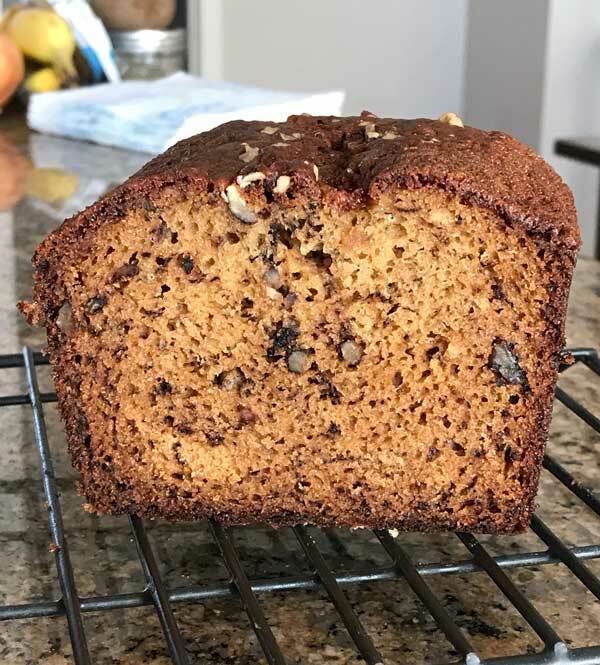 Lately I’ve been making the High Rising Banana Bread and the Best Ever Banana Bread but this is a good one too, plus it’s a little different. I got a very similar recipe from a friend. Hers uses parchment paper and bakes at 275 for 2.5 hours but has no nuts or vanilla, slightly less flour and sugar, only a dash of salt and just 3 tsps baking soda, not 3.5. My friend makes it all the time for brunches. I just tried making it for the first time. It is indeed amazing and so delicious. My friend’s and now mine come out darker brown than your photo. It looks as if it’s made with molasses but it’s not. Anyway, I’m glad I found you on the web because my friend lives several times zones away. How do you store this bread? I want it to last for a few days because I’m having guests then. Plus I don’t want to eat the whole thing myself, easy as that would be! Thanks! Glad you liked it! Thanks for the review, J! I just dumped all the stuff together and baked (as was I) at 2.5 hours. I let cool and then enjoyed a slice with my bhang chai before going into the arms of Morpheus until morning. This recipe is the one. Jan, I halved the recipe so I used 3 1/2 teaspoons. It’s a lot!! I think that’s what causes the bread to turn brown because baking soda enhances browning. I worried that I would taste the soda, but I really didn’t. I can sometimes taste the soda in ginger cookies or in other baked goods that call for a lot of it, but it just didn’t stand out to much (to me, at least) in this one. Anna: I looked at the recipe on the link you provided and it calls for 7 tps of soda. I don’t know how to read metric. They don’t mean tsp do they? That’s a lot of baking soda, do you taste it? 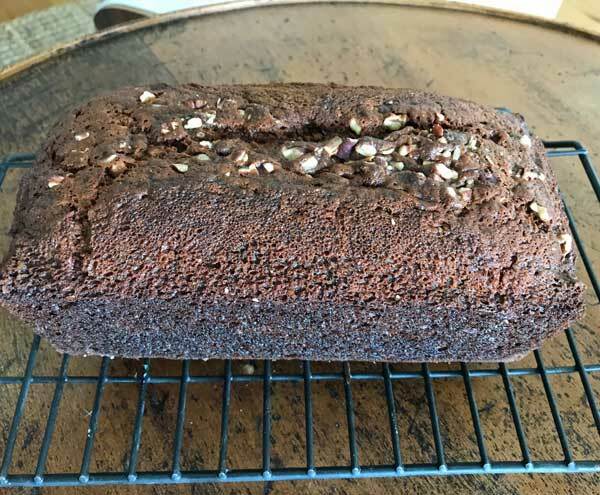 The picture reminds me of a pecan bread that my mother used to make which also came out dark in color like that but I don’t think included brown sugar or any other caramel-colored ingredient…I’ve never found the recipe, and I’m not sure she had it written down. Can’t wait to try this when I get home from Hawaii! Hi Anna – I’m glad you like the recipe. It’s really good with chocolate chips, (about 1/4 cup), added! I have a bunch of frozen bananas that I need to use up. I love banana bread, but have never heard of it being made this way before. I’m intrigued! Sounds like a good baking project for later this week. Can’t wait to hear your opinion! I really like this one. About the eggs and flour, my thought was that adding the eggs slowly with the flour prevents extra air from being whipped into the batter. That is, eggs hold a lot of air, so if you are stirring them gently (as you would flour), you add less air. But that’s just a guess. How interesting! Does the time you add the flour really make such a difference? I have heard of cold oven pound cake, but never a slow oven banana bread. I must try this! And I love rich, dense banana bread. I usually put a strip of parchment paper at the bottom of my loaf cakes and breads if they have a sticky batter.